I’ve been a huge fan of Giacchino’s work since his stellar score for the original Medal of Honor video game in 1999. Then he blew me away a few years later with his positively gorgeous soundtracks for my all-time favorite television drama: Lost. Fast forward to 2014 and Giacchino has won multiple Grammy awards, an Emmy and an Academy Award for his extraordinary musical compositions. When I heard he was going to be in Philadelphia for this movie screening, I jumped at the opportunity to attend the event, and I’m glad I did. Going into the event I had a few questions swirling around in my mind. How is the orchestra going to perform the score live without drowning out the dialogue? Is the orchestra going to be performing over top the soundtrack in the film? And what role will Michael Giacchino play in the event? All of these questions were quickly answered for me once the lights dimmed and Michael Giacchino took to the stage. Looking sharp in a white button-down shirt, a bow-tie and a blazer replete with a pocket square, Giacchino was met with a warm round of applause from the audience. Originally from Riverside, New Jersey, he charmed the crowd by showing a childhood photo of himself on the big screen that clearly displayed his loyalty to the Philadelphia Phillies. 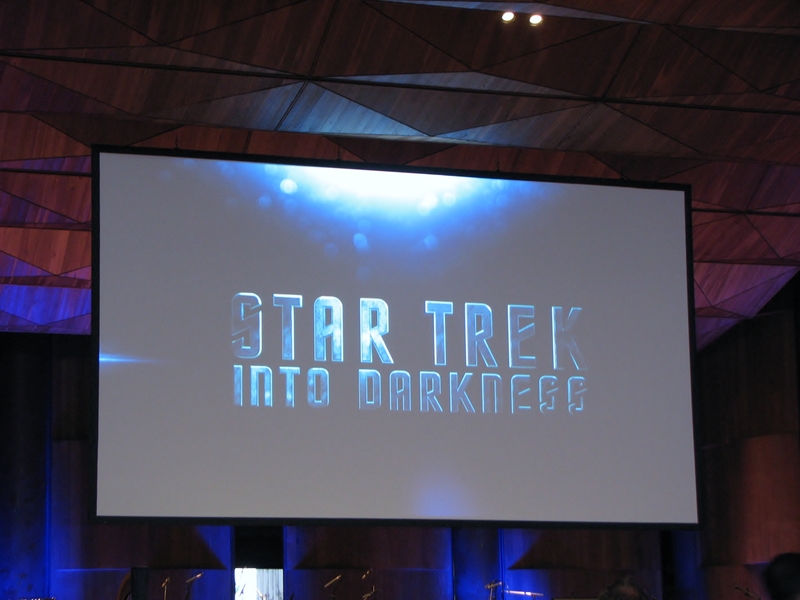 Then, Giacchino introduced Philadelphia Orchestra conductor David Newman and the film began. The soundtrack in the original movie was stripped from the film so it wouldn’t compete with the beautiful music being played by Philadelphia Orchestra, and there were subtitles the entire time to make sure everyone in the crowd could follow along with what was being said. There was an intermission about halfway through, during which I spotted Michael Giacchino in the aisle. As you can see from the image below, he was kind enough to take a photo with me. He did the same for many attendees and autographed their programs too. And the Star Trek pin on his lapel brought a smile to my face when I spotted it. Clearly, this man is a Trekkie at heart. 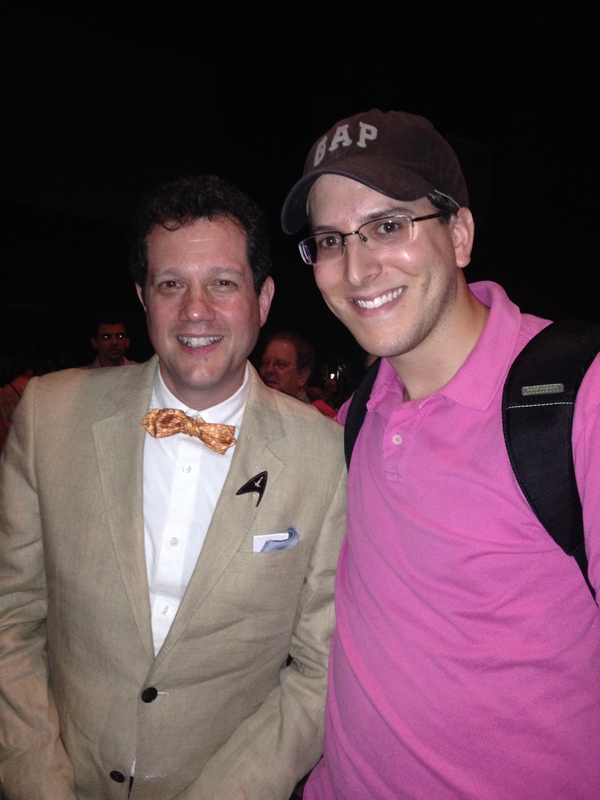 With Michael Giacchino during intermission. What made this event so much fun was that the crowd cheered and applauded throughout the movie. Their applause wasn’t just for the fantastic music that was being played, it was also for the dramatic and sometimes humorous action taking place on the screen. The film resonated with people so much that they felt the urge to cheer when good triumphed over evil or shed a tear during an emotionally moving scene. It made it feel like a sporting event, and I loved it. By the time the final credits rolled, the crowd erupted in applause, especially when Michael Giacchino’s name appeared on the screen. And when he stepped out onto the stage to bid the audience farewell, he – along with David Newman and the Philadelphia Orchestra – was met with a standing ovation. 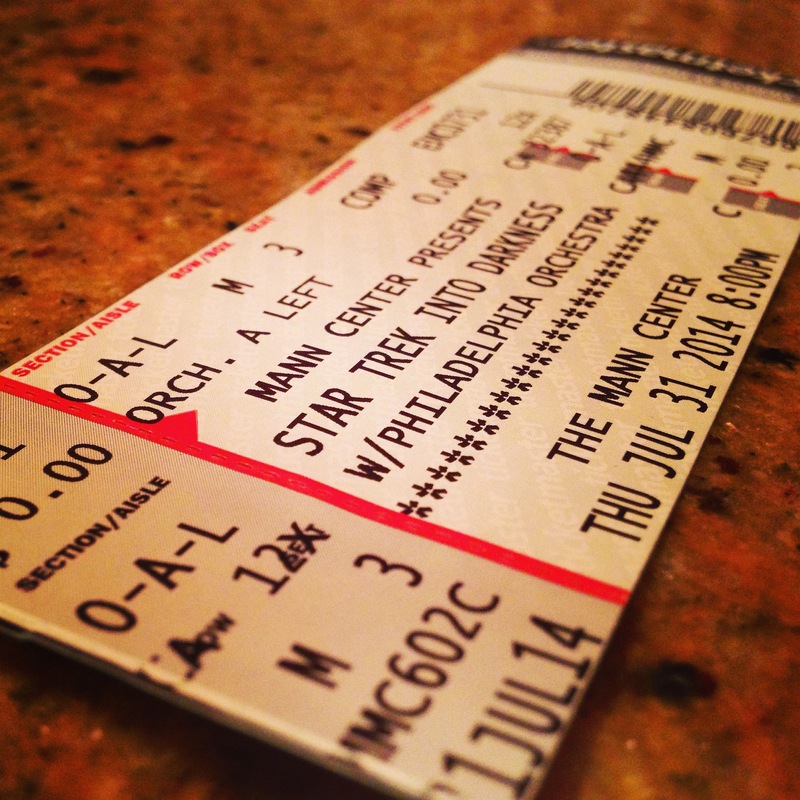 This was the first summer that the Mann Center for the Performing Arts has done this music series and based on the size of the crowd and the reception the Philadelphia Orchestra received, I don’t think it will be the last. I had such a good time that I’d love to attend multiple shows next season, and if you’re in the Philadelphia region you should do the same. As for Michael Giacchino, he’s a shining star who continues to ascend to new heights. If you ever have the chance to meet him or attend an event that he’s part of, do so. His creativity continues to astound me and I can’t wait to see, and hear, what he does next.